One of my favorite techniques for creating a finished edge on paper craft projects is to emboss them. 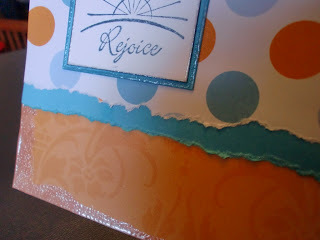 The process is like distressing, but you add the heat embossing powder for some extra shine. 1. Using one corner of the embossing ink pad, swipe the edges of your paper. Imagine that you're distressing the edge, but you're using light ink. The tinted embossing pads make this much easier. 2. Coat inked areas with embossing powder and tap off the excess. 3. Heat with tool until melted and shiny. 4. Repeat the process on all coordinating pieces. For the past month we've been looking at what the Bible says about peace - that perfect peace that goes beyond all understanding. There are a few everlasting truths about peace that come straight from Scripture. We have the pleasure and privilege of having my dad staying with us for week or two. While this is a joy, there's a lot of preparation that goes into opening your home to other people. 1. Keep things in perspective. Remember that your company is here to enjoy time with you, not search through each room and look for problems. Yes, things need to be clean and somewhat tidy, but don't stress out over having every single inch of the house spotless. Inviting, yes. Perfect, no. 2. Make one room a haven. We cleared out our spare bedroom of everything that was junky, cluttered or just taking up room, just so there would be one perfect little place to get away. It has minimal pet hair in it, towels, storage space to unpack and dresser tops for laying things out. It's all about creating a comfort zone for someone unfamiliar with our home. * All coupons would be for the products I use and not solely for name brand and expensive products. * Grocery stores would schedule their weekly sales in correlation with the coupons the manufacturers released. * If a store brand price was less than the name brand price for the same product, you could use your manufacturer's coupon for the store brand product. * Produce producers would give coupons for their MVP customers, since there are rarely coupons for fruits and vegetables. * Your grocery store would send coupons and discounts on the items you purchase most, either mail or e-mail, just for your loyalty. * The store should give you your coupon back after you've used it, then allow you to use it again later in the week. 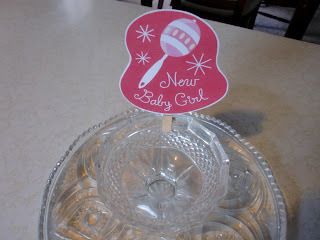 On Saturday we're having a baby shower for my dear friend Gail's daughter. Christi is her oldest child and this will be her first grandchild. So we're trying to make this an extra-special day, but not spend a ton of money. We found dollar store decorations and prizes, and some clever gifts and giveaways. 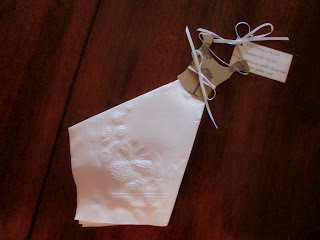 One of my favorite ideas were these clips to decorate the serving table. So easy and so adorable! 1. Find a great computer clip art design on your word processing program. Size it big so it can be seen easily on the table. Cut it out, leaving a small border around the edge. 2. If you want to, mat the cut-out with a coordinating color and decorate with some 3D embellishments. Be as creative as you want. 3. 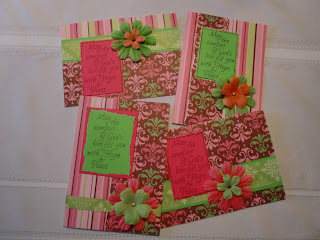 Using the glue dots or glue gun, attach a clothes pin to the back of each cut-out. Glue it far enough down the clip that it won't be wobbly or fall off. I have a tiny piano studio - two students. Before we moved to South Carolina I had upwards of 20, so this is a little more subdued. And easier to schedule around. Teaching piano is natural to me, something that brings joy to my heart. There's an adorable picture of me in my mother's lap at the piano when I was just months old. From the age of four through high school I took, and loved, piano lessons. I can clearly remember hours a week at the piano in our living room, working on scales and playing hymns from my grandmother's Methodist hymnal. It has always been a part of me and something that brings me joy and relaxation. So starting a piano studio seemed natural. But like anything else, there are people (yes, that means parents also) that don't take piano lessons seriously. I'm blessed to have two now that love and cherish their lesson time, but it hasn't always been that way. Why are music lessons, piano in particular, so important? We've had a terribly busy week at our house. There's been so much to do that I would love a couple of extra hours in the day. Obviously the girls do, too. What do you think they'd do with more time every day? Maybe they would take a nice nap and get charged up for the rest of the day. Or just find a good, comfy chair to curl up in. Perhaps they'd like to doze on the living room floor, cuddled up close. Because being close is the best way to spend your spare time - that and snoozing.Or catching some Zzz's on their favorite piece of carpet. Being upside down is optional.So if they really did have more hours in the day, they'd probably spend it zonked out somewhere. Oh, what a life! I think next week we'll finally get our taxes done. It's not that we've put it off - we've had two different appointments now, but the tax center on post has had some problems, so we've been postponed again. While we were figuring out our newest appointment, the sergeant in charge of the tax center scheduling book gave me several tips to make our appointment quick, easy and hopefully painless. 1. Bring in the family's personal information. Have every one's social security, driver's license numbers and birth dates. Make a list of all important dates from the past year (marriages, births) and have it ready if you're asked. 2. Make sure you have identification. Bring your driver's license, social security card and military ID. 3. Have documentation handy. If you've gotten married, had a child, purchased a home, gone back to school or made any other life changes, bring all those papers with you. Apparently I was born with sugar running through my veins. My cravings are never for salty snacks or carbonated beverages. 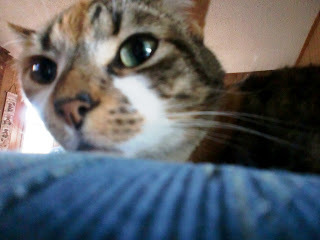 I want sweets! However, we're in the middle of P90X again and to see the results I want, sugar has to be minimized. So what are the other choices? Do I have to forgo them altogether? Of course not! We can all make healthy food choices and still get that little kick of sweets that keeps us going. Being food-conscious doesn't mean cutting out everything we enjoy, just eating in moderation. Try some of these snack ideas instead of running out for cookies and donuts. Yesterday I wrote a bit about taking the control of your life out of your own hands and giving it to God. Our flesh tells us that this is a very difficult process and a very scary thing that probably shouldn't even be tried. But you know what happens if you try to control all of those little, unpredictable situations that happen in your life every day. You get frazzled, worry wears you out and you turn into someone you never wanted to be. All because you didn't just turn things over to the Lord. So all of the peace in your life is gone because you've gotten overwhelmed. You're stretched thin and being pulled in a hundred different directions. And know you're ready to give everything up and sit in the corner with your blankie...just until it all goes away. Over the past couple of weeks, I've had several circumstances roll through my life that I haven't had the power to control. I think about that button on the computer keyboard - Ctrl. The control button has the power to change the function of other keys, but I sure don't have power like that. As weak and helpless as I have felt lately, it shook me awake to some very concrete realizations. You can't control what other people say. You can't control what God has already set in motion. You can't control the actions of anyone other than yourself. You can't control accidents that may come along. You can't control people's reactions to what you do and say. You can't control or prevent the evil that's in the world. By the time evening rolls around at our house, we're lucky to be sitting upright. There are some days a woman just wants to sit and vegetate in front of the television. But there are still tons of things that need to get done. How can you strike a balance between relaxing for the evening and being productive? What a crazy concept! Have you really thought about all the things you could be doing while you enjoy your favorite shows? Try some of these TV-multitasking ideas and see what works for you. * Craft. We've been making little dresses for our Ladies' Jubilee while watching TV and movies. Doing something mindless with your hands, like knitting or stamping, leaves you free to think about your show. * Sort a drawer. Pull out a kitchen or dresser drawer and bring it into the living room. Keep a trash can nearby. * File paperwork. Shred during the commercials. When I was growing up I remember hearing the phrase "Mad Money." That was those few dollars of your own that you could spend any way you liked. As a child you weren't likely to save it, but find little trinkets, a handful of candy or a ride on the mechanical horse outside the grocery store. But now that you're wearing big girls clothes, you probably have a little more access to cash but still don't really know what to spend it on. Here's a thought...use your "extra" money for special experiences, not things. Here are some examples. * Take a friend out for a donut and coffee. * Get two full meals from the value menu at your favorite restaurant with your husband. * Find a couple of great new dog toys and head for the park. * Jump-start your spring by buying a new bird feeder. * Get all the ingredients to have "Ice Cream Sundae Night." Due to several jumbled-up reasons, I have been in a terrible cooking rut lately. What does that mean? I have been relying on the same handful of recipes over and over again. No creativity. No surprises. No new ingredients. No culinary adventure. If you're having the same problem, or just want to spice things up (literally or figuratively), join me in getting back into the swing of kitchen fun! Start today by using this guide to plan the next week of meals. Sunday: Put together a slow-cooker meal that will be ready when you get home from church. Monday: Plan an entire meal using just your grocery store's sale paper. You'll save a bucket of money and use some ingredients you might not normally choose. Tuesday: Make putting dinner together a family affair. Choose the menu together, assign tasks and spend the entire time in the kitchen as a family. 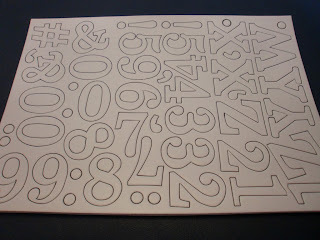 The easiest way to add dimension and texture to any paper craft is with chipboard letters and shapes. But what if you don't want a stark white piece of chipboard on your project? How can you coordinate it with the papers and colors you're already using? With some ink, embellishments and a couple of tools, you can make even the most boring alphabet look like it was just meant to be on your page. S - Using a stipple brush or ink dauber, layer three or four shades of stamping ink onto each letter. Start with the lightest, then get darker as you go further down. H - Cover the shape with adhesive, the lay it upside down on the back of a piece of patterned paper. Using a craft knife or sharp scissors cut around the edges. M - Apply ink in a coordinating color to the entire shape. Then place stickers on and trim using craft knife or scissors. R - Using embossing ink and powder, cover and heat emboss the shape. T - Ink the letter with a dark ink, and the cover it with liquid glass. There are many days when I feel a certain level of peace in my life. I'm in that comfortable groove that settles me and keeps me in close to the Lord's side. Then something happens - something in the circumstances around me - and I'm knocked out of that safe groove. It might be sickness, a family emergency, sudden financial strain or an argument with a loved one. The cause doesn't matter because all I know is that the peace I was relying on has disappeared. Suddenly I'm anxious and stressed over all the little things. Does this sound like a familiar situation in your own life? Peace is easy to sense when you're in the comfort zone of your usual life, but it seems to vanish during the trials and tribulations. One of the greatest challenges a woman faces in her home-keeping is making updates and pretty changes without spending an arm and a leg. We're to be good stewards of all God has given us. This means using our money and resources in the most responsible way we can. If we put in a little time and effort, we can update our home's look, enjoy some new design and prepare for spring. There are plenty of smaller projects that can be done in a day or a weekend at the most. Many are also perfect for renters or apartment-dwellers. Will one of these work in your home? * Paint one wall in the room an accent color. * Change out the light switch and outlet covers to something updated and coordinating. * Hang new paintings and pictures on the walls. * If yours are tacky and broken, replace kitchen and bathroom hardware. * Replace the knobs and handles on drawers and cabinets. * Exchange your winter blinds and drapes for something light and airy. Spring is almost official here in South Carolina. With warmer temps in the Midlands and elsewhere in the country, our dogs are spending more time outside enjoying the sunshine. If you're in the same situation (or will be in the next few weeks), start thinking about what special needs your dogs have in the spring. * Get a vet check-up. Before spending too much time outside with your dog, take her to the vet's office for a physical. You need to update parasite and seasonal insects, and this is a great time to get shots and vaccinations updated. This is especially important if you plan to frequent the dog park. After being inside for the past several months, have your dog checked for allergies. investigate her eating habits and ask about an exercise plan. Have you heard about Etsy yet? This website - www.etsy.com - is a community that allows arts-and-crafts people to connect with shoppers who would love to buy their work. It's a one-stop-shop for handmade jewelry, clothing, painting, woodworking and so many other talents. Danny and I opened a shop in January and are having a blast with it! Etsy has provided us with a way to showcase what we make to a wide audience. There's no way we could have reached so many people in so many places without a site like this. If you're looking for something special and different like a custom piece of artwork or a hand-stitched pocketbook, you can browse from the comfort of your home. If you are interested in a vintage table or a crocheted baby set, you can search the site and even make request for personalized pieces. This basic pasta recipe is so versatile and simple to adjust to your personal taste. Put together the ingredients here, then mix in all your favorites. This is the perfect dish for a throw-together-night or a clean-out-the-pantry-night. 2. Cook and drain the pasta as directed in a very large pot. Return the pasta to pot. 3. Cook and drain the ground meat. 4. In the pasta pot, mix the pasta, sauce, meat and Parmesan cheese. Spoon the mixture into a 13x9-inch baking dish. Top liberally with Mozzarella cheese. 5. Bake at 375 degrees for 20 minutes, until cheeses are browned. Before you throw out those old denim skirts or your husband's worn-out jeans, cut off those back pockets and make this adorable magnet craft. 1. Using a pair of sharp scissors, cut out the back pockets, keeping the two layers intact. You want to have the two layers to make the actual pocket for putting your treasures in. 2. Decorate with paints and embellishments. Using the self-stick versions will be quicker and easier, plus you can find them in any craft department. 3. When all the paint is dry, attach the magnets to the back of the pocket. If you can't find the self-stick magnets, adhere them with a glue gun. We can look everywhere the world points and we'll never find deep-seeded peace. We can make resolutions, read books and have a million conversations, but we'll never find peace. When one of my dearest friends gives her testimony, she always talks about how she could never find peace in her life - until she got saved. In God's eyes, peace is that tranquility that only settles upon us when we accept Him. That peace then becomes available daily as we build our relationship with Him. But why is this concept so difficult? Many women go through life looking under every rock possible to find calmness in the hustle of today's world. In our personal effort is to be keepers at home, think about the first thing that people see when they walk into your house. Whether you have an actual hallway like we do, or your door opens directly into a room, that entry area leaves a lasting impression on visitors and family members alike. So what is it that people are going to see in your entryway? Do you have coats and boots piled up or is the area cleared out and clean? Did everyone drop their stuff there when they came home today or does each item have its own place? Have you even thought about that initial visual of your home?